In 2018, Ayanna Soynini Pressley became the first African American woman elected to represent the 7th District in Massachusetts. She unseated ten-term congressman Michael Capuano, a Democrat, in the August primary of that year. Ayanna Soynini Pressley was born on February 3, 1974, in Chicago, Illinois to parents Sandra and Martin Pressley. She grew up on the north side of Chicago and attended Francis W. Parker School, a kindergarten-through-grade-twelve private school near Lincoln Park, Illinois. In her senior year at Parker, Pressley was voted most likely to be mayor of Chicago. In 1992, Pressley entered Boston University Metropolitan College. While in college, Pressley took an internship in the office of Congressman Joseph P. Kennedy. In 1994, she left college to work full time for Congressman Kennedy, assisting him as his constituency director and scheduling his political events. In 2009, Ayanna Pressley became the political director and senior aide for Massachusetts Senator John Kerry. In November of that year she was elected to the Boston City Council. With her swearing-in on January 4, 2010, Ayanna Pressley became the first woman of color to ever serve on the Boston City Council. As a Councilwoman, Pressley formed and served on the Committee on Healthy Women, Families and Communities. She was re-elected to the city council in the 2011, 2013 and 2015. In 2018, Pressley challenged Michael Capuano, the ten-term congressman representing the 7th district in Massachusetts, for his seat in the Democratic primary. She defeated Capuano by 18 points. In the general election, she ran unopposed becoming the first African American woman sent to congress by the Commonwealth of Massachusetts. This district, which includes most of the northern section of Boston, most of Cambridge and all of Chelsea and Somerville, was once represented by President John F. Kennedy and longtime Speaker of the U.S. House of Representatives Thomas Philip “Tip” O’Neill. Ayanna Pressley’s focus in Congress will be on issues surrounding poverty, building healthy communities, and empowering women and girls. During her first week in office, Pressley co-authored HR 8: The Bipartisan Background Check Act of 2019. She currently serves on the Financial Services and Oversight and Reform Committees. Pressley is married and lives her husband Conan Harris and daughter Cora in Dorchester, Massachusetts. Harris, who redirected his life after a troubled youth that included prison, is the deputy director of public safety initiatives for current Boston Mayor Martin Walsh. Harris is also the director of the Boston Chapter of My Brother’s Keeper, a mentoring program started by President Barack Obama in 2014. 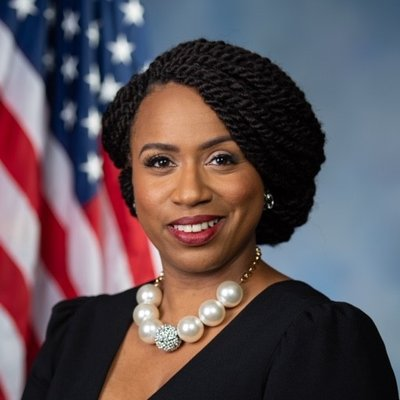 “Ayanna Pressley,” Girl Voices Lead, https://womenleadership.blog/; Steve LeBlanc and Bob Salsberg, “Ayanna Pressley defeats 10 term Massachusetts congressman.” Christian Science Monitor, September 5, 2018, https://www.csmonitor.com/USA/Politics/2018/0905/Ayanna-Pressley-defeats-10-term-Massachusetts-congressman; “Ayanna Pressley Bio Husband, Wedding, Education and Net Worth,” Politician, September 6, 2018; https://allstarbio.com/ayanna-pressley-bio-husband-wedding-education-net-worth; Boston’s Ayanna Pressley Follows Trail Blazed by Alexandria Ocasio-Cortez,” The Guardian September 4, 2018, https://www.theguardian.com/us-news/2018/sep/04/ayanna-pressley-massachusetts-congress-democratic-primary.